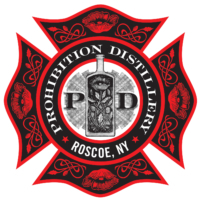 Prohibition Distillery is located in an old firehouse in Roscoe, NY. The Distillery was inspired by the very history behind distilling in the United States - for it was on that fateful day in 1920 when the 18th Amendment was enacted, subsequently outlawing the sale of liquor, that the heyday of American spirits was born. This inspiration is evident in their distilling methods, the spirits they produce and all of their product branding.